TAG's Young Professionals society met Wednesday, April 13th at The Ivy in Buckhead to discuss the do's and don't of professional networking. A host of TAG board members led a panel discussion centered on networking etiquette at 'Bizology 101: What They Didn't Teach You in School' to a packed crowd of about 50, well, young professionals. 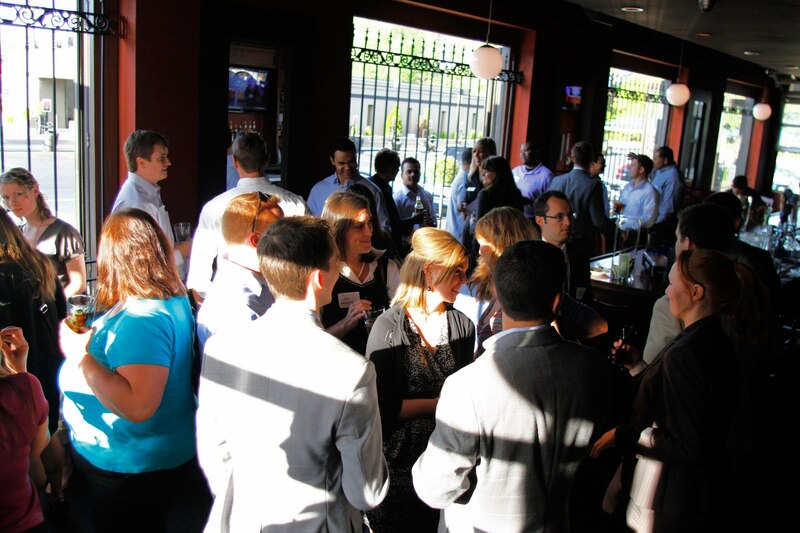 "Networking doesn't have to be a high-stress environment," said Josh Lewis, TAG's Young Professionals Staff Liason and co-organizer of the event. "It doesn't have to be a scary thing. It's a beneficial thing." The advice amounted to a hodge podge of personal experiences and general advice. Many of the speakers agree with, reiterated, or added to their fellow presenters recommendations. The underlying theme reiterated the importance of networking. Every panelest had a business success story derived from a networking experience. "If it wasn't for networking the vast majority of the important people in my life I wouldn't have met," said Marcus Bearden, VP of Technology at Caceron and panelest at the event. By his own account he met his two biggest clients, his best friend, and his current roommate through professional networking. At the event, judging by a show of hands, the majority of the young professionals in attendance made a contact that night they planned to follow-up on (myself included). Why is networking important? How do you begin? - Everyone on the panel had landed a job or gained clients from networking. - Don't be scared to break the ice. EVERYONE is there to network, not just you. - Don't be scared to interrupt a circle. It shows you can be direct and get things done. What is proper networking etiquette? How long should I talk to someone? - DON'T SELL YOURSELF! It looks desperate. - Have a short 'elevator pitch' about who you are and what you do. - Build rapport. Make it personal. It's not all about work. - Ask 3 questions: 1) Where do you work? 2) What do you do? 3) How can I help? - At national events consider asking question 4: Where are you from? Should I eat and/or drink while networking? - One or the other, not both. - Have common sense. Do what your Mom taught you. What are some of the best tactics to remember names? - Only go to networking events with name tags. - Make notes on back of their business card. What's the best way to follow-up after the event? - If you make a really good contact the follow-up begins during the conversation. ..phone call = highest priority, LinkedIn = lowest, e-mail = somewhere in the middle. - Set expectations and be consistent. - Build the relationship over a series of meetings and events. What are the biggest does and don'ts of networking? - DON'T SELL YOURSELF! "Don't be that guy." - Be genuine. "Don't promise the moon if you can't deliver." - Be consistent. Follow through. The Technology Association of Georgia's Young Professionals meet the second Wednesday of each month. Their next event is a networking mixer and Braves game (no panel discussion this time) on March 11, 2011 at Turner Field.